in 7 days, up to 14 persons. 2 double overnight stays. The white sea of houses of Nice shines in the bay of the angels. 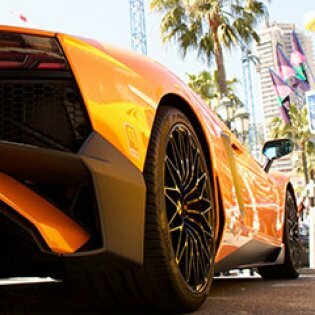 The metropolis at the Cote d’Azur receives its guests multi-faceted from the refined “Promenade des Anglais” to the traditional pulsating market and in the narrow alleys of the old town. 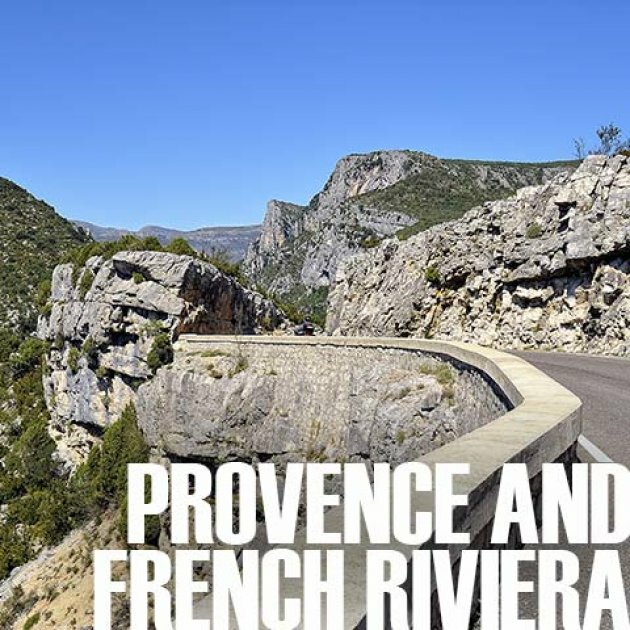 Travel the lonesome Haute Provence on eBikes, cross the Canyon de Verdon and see the sophisticated coast near St. Tropez. Likeable hotels, tastefully furnished country hotels and best Mediterranean cuisine are waiting for you in a picturesque environment Magical Côte d’Azur and memorable Haute Provence, a pedelon travel in the legendary South of France. Flights to/from Nice booked by you or by pedelon at your request. Saturdays directly from Munich and Frankfurt, from any other German airport with transfer in Munich or Frankfurt. By taxi (7 km, approx. 25 €) or by bus No. 98 “Riquier Aéroport” to the stop Congrès/ Promenade and then 550 m on foot via the “rue de congrès” to the “Hôtel Windsor Nice”. An exceptional four-star house, with very individual rooms and a fabulous palm garden inviting you for breakfast. Nice can be reached in one day by train from Munich and Stuttgart with at least two transfers in Strasbourg, Lyon or Avignon. At least 16 hours from Hamburg and Berlin, connected to several transfers. Direct motorway connection to Nice, the starting point of the travel. Parking is reasonable only at the airport because of the few and expensive parking in the city. By taxi (25 €) or public bus it takes about ten minutes to reach the hotel. At the end of your trip, we will return you to your car free of charge. With your booking confirmation, you will receive the “pedelon travel information”, which contains useful notes on travelling to Nice and other advice around your trip. View of the Angel Bay of Nice. The overnight stay and breakfast Saturday to Sunday and the first dinner together are included in the travel price. If you arrive early, you can walk from the “Hôtel Windsor” to the Promenade des Anglais or explore the narrow streets and picturesque squares around the flower market on the Cour Saleya in the old town. Meeting for the round tour of the town at 6 PM in the hotel hall and then dinner in a cozy restaurant in the old town. In the shade of plane trees in Trigance. and to Castellane on a level route. The pretty village is at the entrance of the Verdon canyon and in front of a steep, rough rock leading up to a high plateau with the church Notre Dame du Roc. In town, many sycamores offer shaded places. Bistros and cafés invite you to sit and look. After lunch break, you will have another 22 kilometers to the hotel in Trigance ahead of you. The first part goes across a lonesome street, always slightly uphill. It is pure joy on eBikes and an ideal route to become familiar with the electromotor-supported bike. You can see the impressive fortress of Trigance, today’s destination, from afar. The impressive castle was built by monks from Marseille in the 9th century. Today, it houses a renowned hotel. As a guest, you can enjoy the legendary view of the village of Trigance and the landscape which is under nature protection. Outstanding dinner in the hotel restaurant in the historical walls. View into the “Grand Canyon” of France. On silent paths, you will continue on towards “Gorges de Verdon” after breakfast. Today, the cyclist will be in for a breath-taking nature experience. The Verdon with its clear, turquoise water, flows through the “Grand Canyon” of France into the immense gorge before snaking downwards for approx. 21 kilometers. In the deepest places, the water has cut more than 700 meters into the mountain massif. The bicycle route leads along the Southern side of the canyon, always in contact with the gorge. Across the Pont de l’Artuby, you will cross a side river of the Verdon, with a dizzy-making 182 meters between the viaduct and the bottom of the valley. The cycling tour will be interrupted many times by great views and many photo stops, until you reach the Lac de Sainte Croix and thus the end of the rocky gorge, in the afternoon. Where lavender fields snuggle up to the steep banks of the Verdon, there is the small town of St. Laurent du Verdon. Here, Edith and Nicolas own a beautifully restored olive oil mill from the 17th century: the “Le Moulin du Château”. Idyllic nature, calm and tasty provincial cuisine are outstanding features of this hotel. The rooms are furnished pleasantly simply according to the principle of “As much as necessary, as little as possible”. Even though you are in the middle of the Provence, the busy life of Cannes and Saint Tropez seems far away (two nights). At the Lac de Ste-Croix. After breakfast, you will start out to Moustier-Ste-Marie with a pretty cycling route without considerable climbs through holm oak and pine forests. 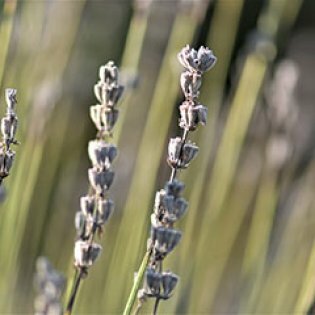 Soon, the landscape will change: Wide-spread lavender fields will offer a wide view. In summer, the entire Plateau de Valensole smells intensely of lavender. Thousands of bees and bumblebees hum in the violet fields. 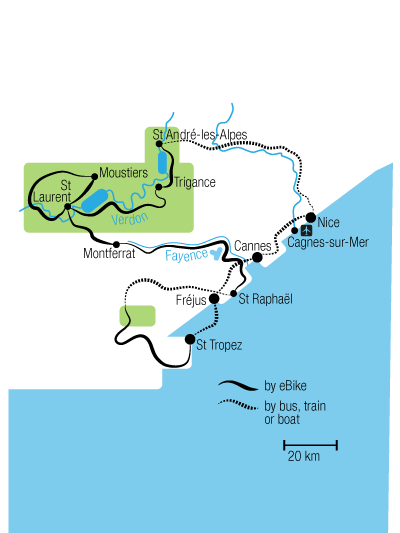 Around noon, you will reach Moustiers-Sainte-Marie, North of Lac de Ste-Croix. The picturesque village hugs the rocky wall, looking for protection. This incredible place is guarded by a small pilgrims’ chapel high above, accessible only by a steep path. Above it all, a star shines on the rocky wall, a mystical guardian of the village. Springs originate in the town. They are very generous even in summer. The spring water rushes into the depths between the houses. The way back to “Moulin du Château” leads along the Lac de St. Croix, at 22 square kilometers the second-largest artificial lake of France. Creating it drowned a village and a large bridge from the 6th century. The lake is a popular destination for bathers and water sports enthusiasts. Late in the afternoon, you will return to the hotel in St. Laurent de Verdon. You will have dinner in a fine restaurant in the area. In the morning, the cycling route will follow the hills of the Var towards the East. After half an hour’s cycling, you will reach Aups, known and well-visited for its Wednesday market. 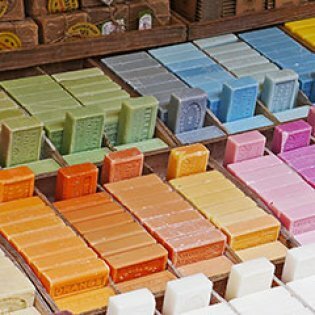 It is great fun to watch the traders and farmers with their colorful market stalls in the Medieval streets and alleys. You will continue up and down through the olive plantations and vineyards to Tourtour, one of the most beautiful villages of France, by eBike. At the highest point of the village, there is the Romanesque church of Saint-Denis. The view from here is great. If the weather is good, you will even be able to see the Mediterranean. The picturesque village core is care-free and invites you to stay, surrounded by old buildings in the shadow of old sycamore trees. The remaining kilometers will lead you through the Pays de Fayence to Seillans, the destination of this day. Through the centuries, the buildings here have been constructed in levels on the stone ground, which makes them look as if they were growing right from the rock. If you are walking through the narrow cobblestone streets, you will understand why this place where history and beauty merge in a wonderful manner has inspired so many artists. German painter Max Ernst settled there for the last years of his life in 1964. Very close by, you will find a villa from the 17th century, surrounded by majestic sycamores. Today, it is an enchanting, family-owned hotel. The owners of the “Deux Rocs” have created a small universe here that will make everyone feel at home right away. Family heirlooms, textiles with floral patterns and refined fabric wallpapers give the rooms an intimate, warm character. Depending on the weather, dinner will be served in the old restaurant of the hotel or under the magnificent sycamores. Sailboats in the harbor of St Raphaël. You will probably not want to leave this pretty place again, but the Mediterranean calls at today‘s destination. To make your departure easier, the first village along the morning‘s section is another Provencial jewel. A little later, you can continue towards the Esterel mountains. 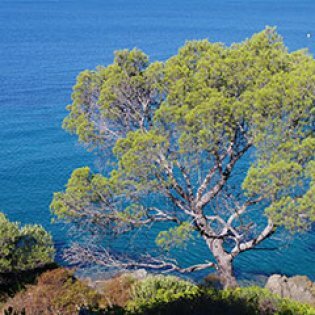 The coastal section between Cannes and Saint-Raphaël is one of the regions of the Côte d’Azur with the most beautiful landscapes. With its reddish porphyry rocks, the ruffed mountain ridge offers an interesting color contrast with the blue sea and the lush green vegetation. From Cannes, you will continue on through the Esterel massif on small gravel roads that are good for cycling on. 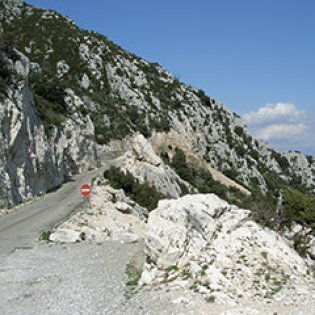 After a slightly extended climb that is more fun than work on an eBike, you will have a wonderful view of the Mediterranean and the coast from Cannes to Nice from the small pass. The exciting day‘s section ends in St. Raphael at the Romantik Hôtel Villa La Chêneraie. A particularly tastefully furnished house, very personally managed and equipped with every comfort (swimming pool). For dinner, we will take a taxi to the port in one of the best restaurants in town. Magnificent views of the azure blue Corniche des Maures. After breakfast with a view of the bay of St Tropez, a bus will take you to the Col de Cagou-Ven in about an hour‘s drive. 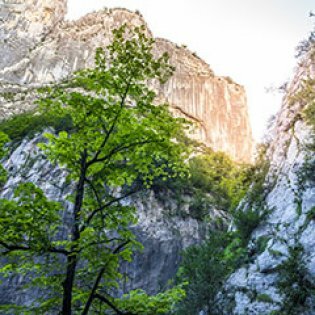 The last cycling section of this journey will lead you to the „Massif des Maures“, a small mountain range along the Mediterranean coast between Fréjus in the East and Hyères in the West, on silent paths. On lonesome streets through thinly settled valleys, you will reach the peninsula of St Tropez suddenly and soon after this the cradle of the international jet set. In the 1950s, St Tropez developed from a small fishing village to the Mecca for artists and High Society. Once just a colony of artists with painters like Signac and Matisse, St Tropez turned into a sophisticated bathing location with exclusive beach clubs in the 1960s thanks to Brigitte Bardot and Gunter Sachs. Even though it seems difficult to imagine: just a few steps away from the yacht harbor and the luxurious beach promenade, there are pretty little alleys with small dreamy gardens and likeable bars and cafés. Late in the afternoon, the passenger ship will return you from St Tropez to St Raphael, a particularity beautiful and worthy end of the cycling trip. On the last evening, you will dine in an interesting restaurant with good cuisine near the old harbor of Fréjus. 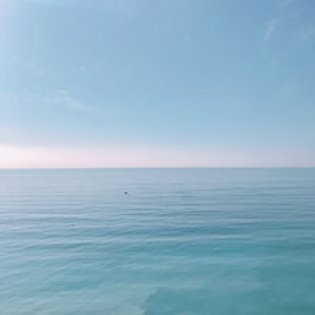 Before the bus will return you to the airport or the partner hotel in Nice, you can take a last bath in the sea before breakfast. The region is so overly rich in interesting sights that an additional stay will always pay off. Advice for this can be found in the “pedelon travel information”. we would like to subsequently thank you for the bicycle tour from Nice into the Provence. It was wonderful. We are still dreaming of what you enabled us to experience. We can assure you that this was a special trip that we will remember for a long time. We hope that we will stay healthy and that we will be able to set out with you again next year. 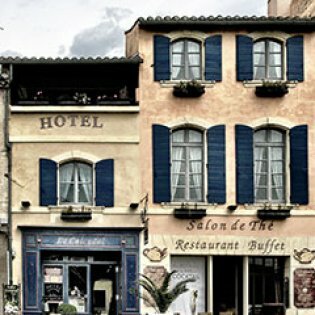 About the people and the real life in southern france. A road trip through rich culture and good wine. No lavender or standard landscapes here in this clip… just the real flair. Stunning views from above over famous Verdon valley Verdon. A funny combination of timelapse and simulated “tilt-shift”.